Mingyur Drakpa Sengé born in Nepal (b.1995) as the son of Beru Khyentse Rinpoche. ↑ Chögyam Trungpa's third son. 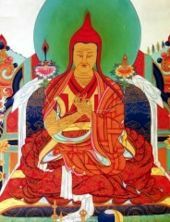 Shechen Rabjam Rinpoche is also considered to be the combined emanation of the previous Shechen Kongtrul, Shechen Rabjam, and Shechen Gyaltsap, Gyurme Pema Dorje. This page was last edited on 30 April 2018, at 12:45.